Recently, before Christmas and in the throes of trying to establish a new world record for sugar consumption, I bought a box of gulab jamun from the local supermarket. I’ve eaten a few Indian sweets before on the mean streets of Tooting: kulfi on a stick, jalebis and so on, each time suffering an immediate and swift ecstatic rush followed by an instant diabetic death., but these were in a league of their own. They came in a palatial bath of syrup, enough to upset even the most sweet toothed cake lover. Of course, I ate the whole box. So now, as life is slowly groaning back into gear and constantly attempting to violate our cosy January, I am as much as possible off the sugar. This, in part is an attempt to try and regain my Adonis-like figure*, which I seem to have misplaced somewhere in 1994, and also, because sugar is, really, the devil’s work. However, we all need a little devil from time to time, so a little treat here and there is necessary to keep up morale. These are my version of the sugar soaked sponge, baked rather than fried and not as soaked in syrup as the original (they also don’t have milk powder in them). You’ll need a round mini cake sphere mould or a cake pop maker, both of which are pretty cheap and easy to find. If not, you could spoon the mix into mini fairy cake moulds. The children loved making and eating these, and it makes a nice change to the icing clad, mouth clagging fairy cakes they usually want and then give up on halfway through. I used a bought caramel sauce that I had leftover from a job, but feel free to make your own, it’s not hard. *not even remotely Adonis-like, more just a lot slimmer than I am now. Heat the oven to 180c or turn on the machine and preheat it. Cream together the butter and sugar until pale and fluffy, then beat in the egg until smooth. Mix together the flour, spices and baking powder and add a little at a time to the butter mix, beating until smooth. Fill the moulds and bake for about seven minutes, until golden. Leave to cool a little. Make the syrup by bringing the sugar, cinnamon powder and water gently to the boil and then reducing it until syrupy, about five minutes. 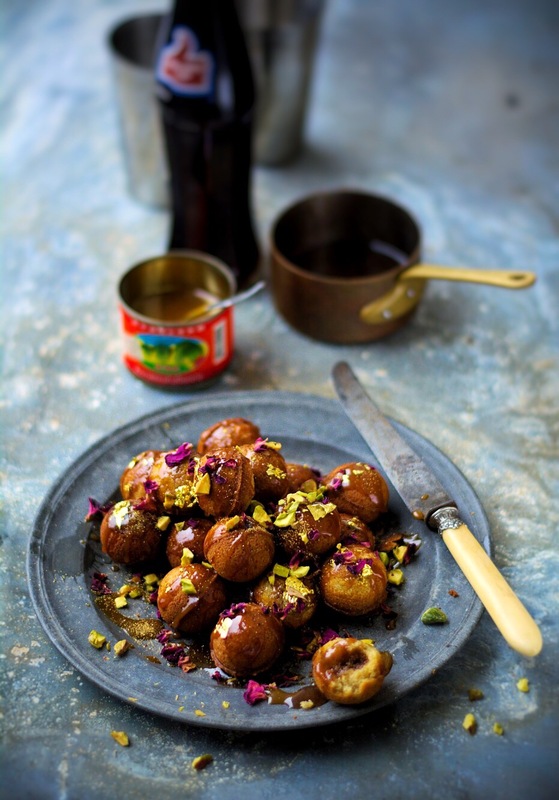 Pile the cake balls onto a plate, pour over the syrup and caramel sauce then sprinkle over the nuts, petals and gold. Serve slightly warm with coffee, or Thums Up! coke if you want a real rush, uncontrollable children and no teeth left.